Canon has updated its PowerShot A series of budget compact cameras. Each of the six new models features a 16 million pixel sensor, DIGIC 4 processing and a 28mm wide-angle zoom lens. The new compacts also feature image stabilisation, although only the more expensive A2400 IS, A3400 IS and A4000 IS feature an optical Image Stabilizer with Intelligent IS technology. This automatically detects the scene being photographed and applies one of six different IS modes, such as Panning ID, Tripod IS or Macro IS. All six models are capable of shooting 720p movies and come complete with a dedicated Movie Record button. A new Auto control gives instant access to Smart Auto mode, while six creative effects, including Miniature and Monochrome can be applied with the touch of a button. To keep the cost down, the entry level PowerShot A810 (£89) and A1300 (£109) are powered by AA batteries. Both cameras feature a 2.7-inch LCD scree, with the A1300 adding an optical viewfinder for improved handling in bright light. 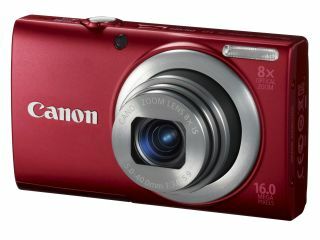 The slim PowerShot A2300 (£119) is aimed at fashion-conscious photographers and is available in four different colours. Almost identical in terms of specifications, the A2400 IS (£129) adds both optical and Intelligent Image Stabilisation. Of more interest, perhaps, is the PowerShot A3400 (£149) which packs the first 3-inch touchscreen LCD in the PowerShot A series. This brings both Touch AF and Touch Shutter functionality, with control enhanced further by dedicated Auto, Movie Record and Help buttons. Sitting at the top of the new PowerShot series is the PowerShot A4000 IS, (£169) which is the first PowerShot A model to feature an 8x optical zoom lens. Like the A2300, it metal body comes in a choice of four colours. The PowerShot A4000 IS UK price is £169 and it is available in February. The PowerShot A3400 IS (£149), PowerShot A2400 IS (£129) and PowerShot A2300 (£119) will be available in March. Finally, the PowerShot A810 (£89) and PowerShot A1300 (£109) will be released in April.